THIS WILL ALWAYS MAKE ME HAPPY. 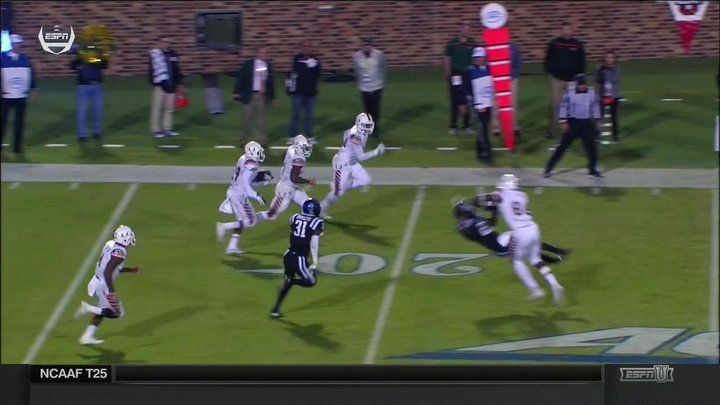 If you missed Miami's incredible game-winning, eight lateral play against Duke last night because you were "out celebrating" the holiday of "Halloween," well, I am so sorry for you. But at least you can watch this now. It's still amazing, even a day later. There's a detailed writeup on SB Nation about this finish, and my goodness do I enjoy the tears of Duke supporters complaining about officials "handing the game" to Miami. Apparently they've briefly forgotten which school they go to (a.k.a. the one who is usually getting help from the officials). Some folks are saying Mark Walton's knee was down before one of the laterals, but the only picture I've seen shows the ball balancing on his hand like a server with a trayful of drinks. That hardly looks like solid possession to me; if the ball is even barely coming out, it's a fumble, and he's therefore not down. Whatever you think of this, it was an awesome play that won't be forgotten anytime soon. AND I LOVE IT.